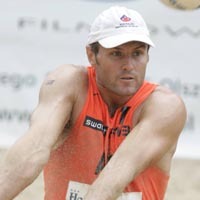 Schacht teamed with Josua Slack to have the pair's best SWATCH-FIVB World Tour season in 2007. Since the Athens 2004 Olympic Games, Schacht and Slack have ranked as the top Australian men’s team on the SWATCH-FIVB World Tour. Paired since 2002, Schacht and Slack’s partnership was highlighted by a pair of medals and three “final four” finishes in 2007. After placing fourth in Croatia, Schacht and Slack claimed a silver medal at the 2007 Canadian stop in Montreal before finishing third at the SWATCH-FIVB World Championships in the Swiss Alps. Schacht and Slack, who placed ninth at the Athens 2004 Olympic Games, rank 20th all-time in FIVB earnings ($401,090) entering the 2008 season for 62 events with three podium placements and five “final four” finishes. Schacht and Slack have won 55.5 percent of their SWATCH matches (157-126). Schacht and Slack’s 2007 earnings ($110,700) for 10 events was the best-ever by an Australia men’s team on the SWATCH-FIVB World Tour.